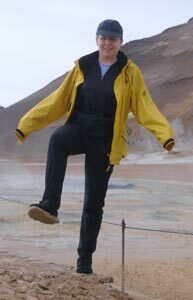 Being an Icelandic tourist was like being at a party as we were always surrounded by other enthusiastic tourists all doing about the same things we were doing. No one was indulging in high-brow pursuits like studying the nuances of medieval stained glass, stalking rare books, or attending expensive performances or openings. Instead, people came to Iceland in their hiking gear to explore the outdoors, with whales, birds and rocks being the hot attractions. And the high prices imposed an economic selection process as well, as the gray-haired travelers like us far out numbered the college kids, even in the youth hostels. One of Iceland's more interesting coastlines..
English is the second language in Iceland and the destination selected for a large number of confident, English-as-a-second-language travelers. In almost any given group of tourists there would be at least one English speaker. Requests to strangers for taking a group photo came readily and people were quick to ask a question of a fellow tourist on a hiking trail or sidewalk. And almost any tourist wanting to engage a stranger offered up English first. We thoroughly enjoyed interacting with more people in our day and eagerly compared experiences with them. As often happens, it was the north-central Europeans with whom we had the most conversations. Many Europeans from that region seem both to have a ready command of English and the welcoming nature that makes them more accessible to us than other nationalities. In Iceland it was the Germans and Belgians with whom we chatted and it was the French and the Italians that pointedly limited the exchange to a brief "Hello" and then turned all of their attention elsewhere. The most thought-provoking exchange we had was with 2 young German men sharing our one-burner community kitchen in our basement guesthouse. The more outgoing of the 2 was confident enough with his English to delve into topics like US oil consumption and its effect on the global economy, the upcoming US elections and some of our theories on the fundamental differences between the cultures of the US and Europe. At the end of the evening, the chattier of the two offered up that Hitler was under-appreciated for all the good things that he had done for Germany and that the war hadn't really affected the daily life of the average German that much. Being left speechless made it hard to continue the dialogue, but his comments certainly provided us the next morning's car ride discussion topic. These 2 young men are from eastern Germany and illustrated some of the very substantial cultural differences between the 2 halves of the reunified country. The western German's have gone to great lengths to root out the beliefs that allowed Hitler to appeal to the masses during the economic hardships of the 1930's. It's our impression that the west German's are the only people in the Axis powers that have "come clean" about their collective responsibility for WWII and are intent on making sure it never happens again. The plaques on streets in Germany that mark the spots where the SS killed people, free museums about the war, and TV documentaries all speak to their drive to not forget what happened and why. And the war cemetery maintenance programs that take German youth to foreign countries to experience the lingering resentment against their country hammers that message into the kids. We see German families at war museums and cemeteries in other countries with the parents carefully explaining the war to their children of all ages. This ongoing educational process has been active in the western half of Germany for decades, whereas in eastern Germany there was no communist government initiative to integrate this dark bit of history. The comments expressed by this east German man are exactly what the west Germans have worked so hard to eliminate but they haven't had as much time to get the message across in eastern Germany. We imagine that Hitler's promises looked better after the war in repressed and Soviet-controlled eastern Germany than in the economic-miracle of post-war western Germany. Perhaps in eastern Germany Hitler was more a part of this man's parent's reminiscing about the "good ol' days" and "what could have been" as they struggled endlessly to get back on their feet after the war. The lack of a deliberate post-war evaluation and healing process in eastern Germany seems to be reflected in this young man's attitudes. His comments certainly helped us better understand why eastern Germany is experiencing a resurgence of skinhead, racist attacks. Of course, our first choice would have been an equally revealing conversation with an Icelander, but like our history lessons, our sociology lessons don't come in any logical order. But it was the high cost of travel and not politics that was a ready comment from any traveler with whom we spoke in Iceland. The young German men were horrified with the price of fast food and perplexed with what to buy in the supermarket. Their usual choices like sausages, cheese and orange juice were draining their pocket books. When we departed, they were cooking up a batch of spaghetti to be topped with canned baked beans for their breakfast, as they had done for dinner the night before. We shared a picnic table with at lunch one day with a dozen Italians who were smugly dining on packages of thinly sliced cured meats and chunks of cheese that they brought with them from Italy. We laughingly wondered how far over the 6 pound per person food limit their group was when they entered the country. And another young German couple, apparently also oblivious to the food weight limit, said they brought 3 pieces of luggage and that one was entirely filled with food. I thought maybe the people arriving in Iceland by ferry with their own vehicles would be shaken down for unwitting food smuggling, but the one person I asked said it hadn't been a problem. What an image was unfolding: hoards of travelers to Iceland all arriving with bags bulging with groceries. Usually people are hauling merchandise out of wealthy countries, not into them. Not one of the half dozen people I asked envisions a second trip to Iceland. No one is disparaging about the sights to see (except in western Iceland) but all considered the cost to be prohibitive, especially since there is no shortage of more budget-sparing destinations in the world. And we weren't the only ones who quivered at the thought of living in Iceland and only having Reykjavik as a destination for a little cultural pizzazz or specialty shopping. Anyway you cut it, traveling in Iceland is expensive. Our very budget-conscious, 17 day trip with a rental car for 14 days cost just under $4,000. The young German couple (with the suitcase of food) had worked hard to get the lowest price on a package deal including a car, lodging, and airfare paid a total of $5,500 for their 16 day trip. They also stayed in sleeping bag-styled accommodations, which was where we met them, but generally stayed at nicer places and definitely spent more freely at the grocery store. We heard second-hand of a British couple using their own car who wasn't so aggressive about cost-cutting and their trip was running about $9,000. 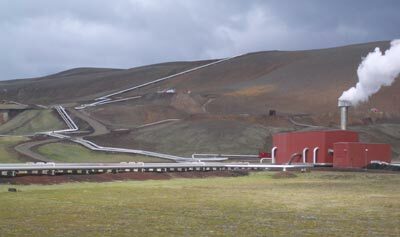 A geothermal plant providing hot water for home & hotel heating. There are several strategies for getting around Iceland including: hitchhiking, biking, public bus, rental car, rental RV, or bringing your own car or RV. Our guide book correctly stated that for 2 people or more, using a bus to get around is about the same price as renting a car. And I suspect that bringing your own vehicle only 'pencils-out' for stays of 3 weeks or more, though I only took a quick look at those costs. Bringing your own RV rig into the country by ferry from the continent is also an expensive option--somewhere in the neighborhood of $2,000 for one person and the vehicle. For lodging, one can camp or choose between sleeping bag accommodations or made-up beds in a guesthouse or hotel. The prices range from sometimes free for camping to $60-80 for sleeping bag accommodations to as much as $400 per night to have a private bathroom in a hotel. Made-up beds with a shared bathroom often start at over $100 per night for 2, with breakfast rarely being included. By far hitching and biking are the cheapest ways to get around Iceland, but the long distances between services makes both options difficult and potentially expensive, like if you get stuck dining in a restaurant to keep from going hungry. We finally offered a hitching couple our age a ride as they had been out on the corner at Lake Mývatn for at least 4 hours. They weren't going our way and were expecting to camp there another night and try again the next morning for a ride. Almost everyone with a car had the smallest one that would do and so didn't have room for even very safe looking hitchhikers like them. And because of the very limited public transportation, the competition for hitching a ride can be high in some areas as hikers often hope to do a one-way hike instead of hiking out and back. Cyclotouring certainly is possible, though it's a rugged undertaking. Carrying an entire day's drinking water is necessary so as not to be caught short, though water should be available at the end of each day with careful planning. Getting enough food to sustain a cyclotourist could be harder. Grocery stores are few and far between and often don't open until 11 am or noon, so timing a stop at the one store on the day's route could be difficult. Both the Polish man we talked with in Reykjavik and a biking Swiss couple we met later, had unexpected diet-days with little or no food to eat. As car travelers, we headed out of Reykjavik with all of the food we would eat for 2 weeks, except for our fruits and vegetables, of which we had about a 5 to 7 day supply. We carried the 80 pounds of food to save money, but on the very first day the scarcity of grocery stores made it clear: having our own stash would be the only way to eat the way we wanted to eat in Iceland. Prepared food could be purchased a couple of times during most days at roadside snack bars, petrol stations and the occasional restaurant if you stayed on the main road, but the quality would be unreliable and the prices fantastic. And for the most part, the food offered wasn't what I would want in my belly, especially when exercising, as the selections were long on hot dogs, fries and pizzas. It's hard for cyclists to escape from the wind like the sheep do. Another challenge for the cyclotourist is the lack of shelter during the day. In many countries we find places to take a break from the wind and rain (or snow) like bus shelters, an open barn, a building overhang, a rock wall or a cluster of trees. Almost none of those exist in Iceland, so you'd never get a reprieve from the persistent wind. The main road around Iceland, The Ring Road, is shoulder-less, though the traffic is usually light. But even this, the main road around Iceland, has miles-long gravel stretches. Some roads are very smooth, hard-pack that drive almost like asphalt, others have a layer of loose chunky stuff with which to contend. But on any of the gravel roads you'd be eating a lot of dust (or mud) when the occasional car passed by. The gravel roads, especially the steep gravel roads, would definitely be one of the challenges of biking Iceland. Our map didn't mark a single steep grade and we drove up and down plenty of them. The worst was a very long stretch of posted 16% grade. We can do short uphill runs of grade in the teens, but it's got to be paved. Our power (especially mine) plummets on a soft or rough surface and the coating of loose gravel on the hard-pack road would have made pedaling too arduous. Had we gone up on this steep grade with bikes, we would have doubled up to push the loaded bikes up one at a time. Going down would have been hard too, though our disc brakes would make the descent more pleasant than conventional brakes. But regardless of our braking equipment, we would have stopped to let each car pass by to avoid making the steep descent in the deepest gravel on the road's edge. A stunning view from the 16% grade, gravel road. We saw a number of cyclotourists in Iceland and all were very heavily loaded with camping gear and no doubt, food. We saw far more solo cyclotourists than we usually see, which is a clue that it is more of an athletic achievement undertaking than a casual holiday outing. 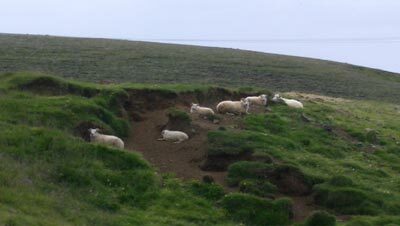 They all looked like they were working hard against the never-ending wind, even when the terrain was relatively flat. I studied the faces of each rider as we passed by and the only one not grimacing was a woman coasting down hill on the back wheel of her companion. Going all the way around Iceland by bike would probably take at least 6 weeks. That would require daily riding of almost 50 mile days, which would be hard to do in Iceland's wind and rain and the occasional steep grades and gravel. And that would be a long time to spend in such harsh conditions. Fortunately for us, the 12 of 14 days predicted with rain didn't materialize and we had plenty of bright days, though they were still cool enough that I rarely shed my long johns. One of the spectacular eruptive sites that is difficult to visit by public bus. Iceland can be explored by public or private bus. Our guide book was quite clear: it's cheaper for 2 or more people traveling together to rent a car than travel by bus, and their opinion was close to our experience. Our 14 day rental of a car and gas came to $1722. A bus pass for a 14 day loop around Iceland with some side trips runs about $500/person or $1,000 for 2 people. Any additional day or part day trips to special sites would range from $50-100 per person, some of which were must-see sights we took in. So, for 2 people the bus can be a little cheaper but for 3 people sharing a car would offer a big savings. And though the east German men we spoke with didn't buy the full loop bus tour, they were missing some great sights because they didn't have a car to access them. And of course having a car or bike cuts down on the strain of schlepping luggage, gives one more choice as to where you sightsee and when, and improves your odds at finding food you consider edible. As often is the case, relying on public transportation doesn't get you close to the remote sights in Iceland nor does it give you access to the less expensive farmhouse lodging out of town (where most of the lodging is located in this country). And even a twosome traveling by bus could easily end up paying more than we did for our trip because of the extra expenses for lodging and food caused by poorer access to them. A couple we met from Switzerland was eager to talk prices. They were traveling by bike--well sort of by bike. We drove almost 2000 miles to make our loop around Iceland and in their loop they estimated having pedaled less than 200 miles. The long distances between sights and services and the fierce winds had unexpectedly weighted their trip heavily towards bus travel. They almost only biked in the more intense sightseeing areas (like Lake Mývatn) and no doubt the bikes were a big help in getting to the campgrounds. Their story explained why we most often saw cyclotourists in clumps at the better sightseeing spots but rarely on the open road in between--many cyclotourists must have also been using the buses, which is very sensible in this difficult environment. I am sure however that there were a handful of those grimacing solo cyclists pedaling every mile of their tour. The Swiss couple didn't offer their estimated total trip cost, though were very curious about our auto expenses. They couldn't believe that we and the German couple were making our 16 and 17 day tours in the $4,000-5,500 range, so they probably were spending more. They tent camped almost every night and had eaten several restaurant meals to deal with the grocery store shortages. As I suspected, they were paying a lot more for food per day--$45 to our $10--in part because they couldn't by in quantity at the cheaper stores. (Prices on things like cabbage were 4 times higher at the small stores and crackers and pasta were at least double.) It sounds like the difficulty in procuring food had left them going hungry on more than one occasion, which also wasn't a surprise to us given the circumstances. Biking and bussing hadn't been an option we considered, but is a reasonable compromise for seeing Iceland. Our guide book mentioned that buses would accept bikes, for a fee, and on a space-available basis. We didn't have the time to sort out just how often that would be possible, and didn't want to risk planning a trip that relied on the buses without doing our homework. As much as this couple had used the bus however, it probably would have been cheaper for them to rent a car, especially considering their extra food costs and not buying the discounted full-loop bus ticket. Of course, that would have deprived them of the fun of biking. But we heard more about the battle with the winds than the joys of cycling from them, so I can imagine they wouldn't bike a second time. Bill rented the smallest, cheapest, 2-wheel drive car he could find on the internet and saved more money by booking it almost 2 months in advance. The final (vs quoted) per day price was about $96, including the fee for an extra driver and gravel insurance. And though Bill consigned the tiniest car available, they delivered a larger car as a free upgrade. The larger car probably got poorer gas mileage, but the trunk was welcome for the extra spaced taken by our mobile grocery store. The more expensive 4WD (four wheel drive) rental vehicles are very popular in Iceland because they give access to the Interior roads, but the conditions in some areas are so extreme that the driver should already be very experienced with off-road driving. In addition, 2 vehicles with 4WD should travel together in case one gets stuck on these challenging roads. We don't have that kind of 4WD experience and weren't looking for that much adventure, so happily spared ourselves the substantial additional expense. What we now know is that there are some intermediate roads that require the higher clearance typical of 4WD vehicles but don't require special driving experience. We would have explored some additional territory for 1 to 2 days if we had had the 4WD capability, though I might have baulked at spending any more time on rough roads than we did. 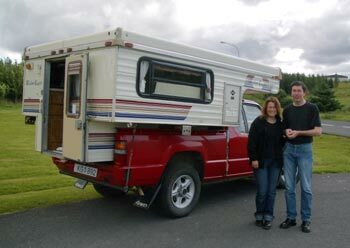 The German couple heading out with the 4WD pop-up camper. Bill looked into renting a small 4WD camper to guarantee us a place to stay every night. We now also realize that they are another way to get the higher clearance needed for some of Iceland's better surfaced, 4 WD-only, roads. A special driver's license is required in Iceland to drive a vehicle as high as a standard US camper, so the rental rigs in Iceland have a flexible vinyl strip that allows the top to be cranked down a foot or so when driving. It's stand-up height on the inside only when in camp. The German couple pictured here was paying $240 per day for the rig (including the fee for the second person) plus about $15 or more a night for a campground so as to have showers and to refill their drinking water. Their petrol prices would be a bit higher than in our rental car because of fewer miles per gallon and they had propane costs for cooking and heating as well. Our equivalent costs for the car rental at $96.80/day plus an average lodging cost of $60.30 (when out of Reykjavik) came to $157.10, almost $100/day less than their vehicle and lodging costs. We had the extra cost and aggravation of having to make phone calls to secure lodging each day, which they did not have with campgrounds. We whined endlessly about those phone calls, but when we realized that our savings from giving up the guaranteed lodging space of a camper was $100 a day, the phone calls didn't look so bad. Spending 2 weeks in a camper when its too cold and windy to enjoy sitting outside could get tedious. After all, the fun of camping is being outside, not sitting inside the box all the time. Our lodging was hardly glamorous, but we did appreciate having the stretching-out room it afforded each evening after spending so many hours in the car during the day. Iceland seems the place to see with an organized tour group. Tour groups often get fantastic deals on lodging, so you can sometimes have much better accommodations for the price with a group than on your own. 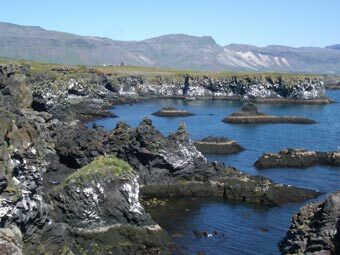 And conventional lodging in Iceland is very expensive and time consuming to arrange. Of course, having a guide to provide explanations for the unusual geologic phenomena and bits of local history also would be great. Group tours usually aren't a good choice for us because our taste in museums is far from mainstream. We head for the iron foundry museum over the art museum and are more interested in how and why a castle was constructed than the furnishings currently in it. And we sometimes happily spend hours in obscure little museums. But in Iceland there aren't such choices to be made. Even though travelers to Iceland come for different reasons, many of us end up seeing exactly the same sights and often at the same pace. And there wasn't a sight we visited that a tour group didn't also visit. Many of the bus drivers stopped in the road as the rest of us did to let their guests snap a photo of birds or horses, so one could gain a lot and give up little with a group tour. Of course, you would want to ensure that a tour group's spin on the sightseeing would satisfy your needs, but a group tour could be an excellent way to enjoy Iceland. 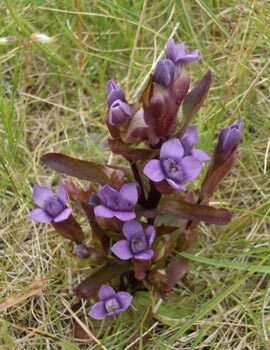 This easily overlooked plant was about 3" tall. Regardless of how you get around the island, tent camping is by far the cheapest lodging and "free" or "wild" camping is legal in many (but not all) places in Iceland. And there are for-fee campgrounds offering a range of services sprinkled around the country. The more comfortable campsites run $10-20 per night for 2 people. The downside of camping is the weather and the bugs. Iceland is noted for cold, rainy weather and we would have probably had a wet tent every day of our 17 day stay in late July as sometimes it rained at night even though we had had a pleasant day. The days generally aren't warm enough to dry your tent out at either the beginning or end of a traveling day. Living in a wet tent wears down my good humor very quickly. The strong winds also make tent camping more challenging and colder. The Swiss cyclists confirmed my suspicions, which was when tent camping and biking in Iceland that you hardly dare to wash your clothes. Some of the campgrounds have a nice supply of hot water and sinks, but unless you spent the entire day in camp, your clothes wouldn't dry. It just isn't warm enough in the late afternoon for them to dry by nightfall and the incredibly changeable weather would make it risky to leave them out unattended all day. And I only saw 2 laundromats mentioned in all of Iceland. We love picnicking outdoors year 'round for our lunches, but on some days in Iceland we were thrilled to escape into our rented car to eat lunch without swarms of little bugs buzzing our ears and faces. They weren't a problem every day, but in some areas, like Lake Mývatn, they are notorious. The midges don't bite but being constantly batted by them is very disconcerting. We just couldn't imagine camping in that area especially, though it had spectacular sights to see. The cool days, the near-constant wind, and occasional swarms of bugs would take the fun out of tent camping for me. Indoor lodging can be very expensive. We had our sleeping bags and camping towels with us in Iceland, which allowed us to use "sleeping bag accommodations" when outside of Reykjavik. We usually had twin beds in a private room with a bathroom down the hall for $60-65 for the 2 of us. Sometimes a community kitchen was available to use and sometimes pillows were provided. The exact same room with towels and bedding would run a $100 or more, still with a shared bath. Unless you are vigilant, you can easily spend $150-300 on a double room. But the weather made camping in Iceland look so grim, we were happy to have the sleeping bag option available. The challenge for cyclotourists that aren't camping is finding reasonably priced accommodations within pedaling range each day. With a car, we were able to travel the extra miles down gravel roads to get to cheaper lodging that we just wouldn't have happily done by bike. But given our price for a car, excluding gas, was about $100 a day, a cyclotouring couple could pay the $160 a night demanded by an isolated hotel or guesthouse now and then and still have a less expensive trip than the rental car traveler. But regardless of whether you arrive by 2 wheels or 4, you better have made reservations 1 to 3 days in advance. You can't just show-up and expect to have a place to stay, which is often what you need with the unpredictability of a cycling day. If you are arranging your own lodging in Iceland, an invaluable free book is "Aning." Once in Iceland it can be picked up at tourist information offices and larger tourist establishments. But you might have one mailed to you by checking their web site www.heimur.is/world or emailing them at aning@heimur.is. It is a paid advertising booklet with almost 300 accommodations and over 100 campgrounds. The booklet has a complex coding system, indicating important features like made-up beds vs sleeping bag rooms, the number of bathrooms, cooking facilities and distances to area features. It also has regional maps locating each of the accommodations, which is a huge help in planning each night's stay. The downside is that it does not list prices nor identify if their sleeping bag accommodations are in private rooms or a single large room for 50 people. The rating systems for farm accommodation, guesthouse, hostel or hotel does bracket the prices somewhat. But we used our Lonely Planet guide book lodging lists that had some overlap with the Aning to pretty quickly predict prices at various overnight places. 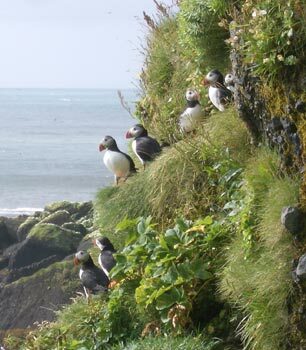 Puffins (& Bill the photographer) clinging to the cliff. When calling for accommodations we always tried to clarify if we'd have a private room for 2 or a shared room (perhaps with mattresses on the floor), if there was a sink in the room (which makes sharing bathrooms less competitive) and if they had a kitchen area we could use. If the price seemed a like too good a deal, we would pursue details like the location of the bathroom, which sometimes can be somewhere across the road instead of in the building. Almost all of the guesthouse operators had a command of English that was up to answering these questions. We never showed up without a reservation and even calling several days in advance sometimes meant calling up to 8 places to find an available private room under $100. During those long hours on the Icelandic roads we pondered how to have better done this trip. The western side of Iceland is the dullest sightseeing with little variation in the terrain and few treasures to seek out, and so we would skip it altogether. Certainly for those tourists coming for the geology, the western side could be bypassed and I don't think it would be a loss to the bird watchers or hikers either. I would fly into Reykjavik and spend a night or 2 there--we spent 3. Then I'd pay the $100 per person bus fee for the 6 hours ride north to Akureyri through the Interior. We only saw a corner of the barren Interior, but imagine it would be a memorable one-day experience that otherwise requires a 4WD vehicle. A reserved rental car could be picked up in Akureyri and driven to Reykjavik over then next 7-10 days for only a $50, 1-way (vs round-trip), premium. 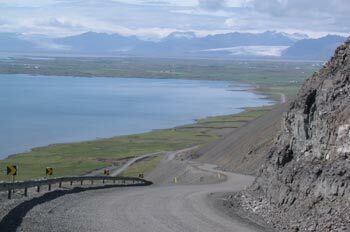 On the first driving day you would head east from Akureyri and arrive at the exciting Lake Mývatn area. Our 2 nights at Lake Mývatn were barely enough but we did get around to all of the spectacles. Continuing east and south from the Lake Mývatn area would offer a close-up look at the glaciers and the birds and line you up for the Golden Circle on the way into Reykjavik, which we did at the beginning of our car trip. This truncated loop would take in all the most interesting sights and keep the "wow" factor much higher than on our full loop on the Ring Road. 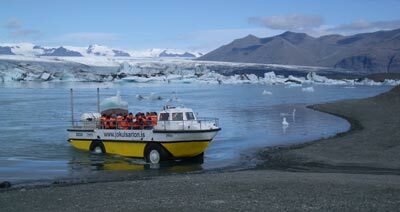 The amphibious craft ride in the glacial lagoon. You can break the bank faster in Iceland than any other place we've been. In most places you have to apply yourself to drop hundreds of dollars a night on hotels and restaurants--in Iceland you have to work not to do that. Even conservative spending for prepared food starts at about $75 per person per day. Thirteen dollars was the usual price for breakfast at a guesthouse and a snack bar lunch started in the same range. Forty dollars looked like the entry price for dinner at most places, with that ranging from buying a chicken salad to a more complete meal but without beverages. Getting standard amenities in your accommodations like a pillow, sheets and towels, a bathroom, phone and TV will easily set you back $300 in places that provoke guide book comments like "thread bare" or "worn". And then there are the more uniquely Icelandic activities. Seeing footage of Iceland's volcanic eruptions cost us $27 and the short amphibious boat ride amongst the icebergs pictured above was $57 for 2 of us. Both the dog sled ride and a snow mobile outing to get a closer look at a glacier tweaked my imagination until I saw their starting prices of $100 an hour per person. Whale watching is a very popular activity in Iceland, but at $100 per person, gambling on seeing a whale was more than we could stomach. (We might have done it if it was the only thing about the trip that was expensive.) A one day salmon fishing license can range from just under $300 to just under $3,000. And there were some tempting daytrip sightseeing opportunities by bus, but at almost $100 a day for car rental, it was hard to leave it idyll and then take a bus into 4WD territory at another $100 a day per person. Yes, Iceland is the place where the equivalent of $100 bills is pocket money. Mosquito head net for deflecting the non-biting but very annoying midges. Plenty of warm clothes for layering and serious rain gear. Light-duty plastic poncho: a great choice for the downpours, even over good rain gear. Light-duty plastic overshoes or galoshes for the gloppy mud at some hot springs. Hiking boots: highly recommended, though our Teva sandals served us well, even hiking across the sharp lava fields. Flip-flops: handy at car washes, in guest houses were "no shoes" was often the rule, and at thermal bathing pools. (the rare laundromat charges about $10 a load for wash only). Sleeping bag, bag liner, and inflatable pillow: to save you $40-50 per night for 2 people in accommodation costs. Food: as much as you can or dare, though raw eggs, meat and cheese are specifically prohibited. We are glad that we went to Iceland but won't go again because navigating around the relentlessly high prices is such a distraction. If Iceland was more normally priced, I might drop in just to see the Lake Mývatn area again. If you wanted to stop-over in Iceland for a few days as part of a bigger trip to Europe or the US, the Lake Mývatn area is where I'd go as it has the most to see in the smallest area. You could quickly get a very representative experience of Iceland in just that region and not feel so stung by the high prices. We'll be leaving Newcastle on the eastern coast of England tomorrow morning, heading towards Edinburgh where we expect to meet friends from California on September 9th. Unfortunately, it's been cool and wet enough the last half of August to be wearing long johns and wool socks again. Bill's right knee is slowly recovering. The climbing is too much for it however, and even pushing his bike up grades over 7-8% hasn't been sparing enough for it. We are still taking short hops on the train when we can to pamper his knee and he needed an extra rest day for his overworked left leg to recover. The need to make reservations 1-2 weeks in advance has forced us to stay on a schedule regardless of how he has been doing. But we are still cautiously optimistic that he'll be fully recovered by the time we get to Edinburgh.